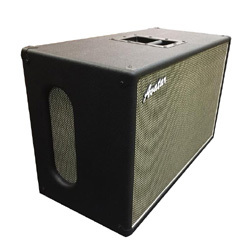 This is one brand new Avatar 3D 212 Horizontal Forte replica guitar speaker cabinet. These are faithful replicas of the Forte 212 Horizontal 3D cabs. The Forte cabs were famous for venting the sound from the rear of the cone outside of the side vents on the cab for a great 3D room filling sound. Dimensions: 3D 212 Horizontal 29W x 14D x 18.5H add 3/4″ to the H for rubber feet. Input jack plate choice: either the regular in/out jack plate for standard 8 ohm cab or Multi Jack for 4 ohm/16 ohm operation.